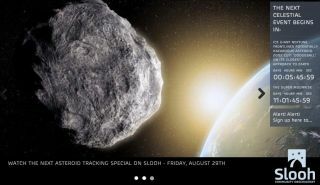 Slooh has received a grant for $30,000 for an asteroid-hunting telescope. The parent company of a group that provides free telescope views over the Internet has received a Connecticut government grant of $30,000 to buy a new telescope. The new telescope for the online Slooh Community Observatory will be used for asteroid research. The telescope, whose size and parameters were not disclosed in a press release, will form part of a network of observatories that are expected to help NASA choose candidate asteroids for a manned mission. The agency intends to send astronauts to a space rock towed into orbit around the moon. Slooh and NASA plan to train citizen astronomers to do follow-up observations of asteroids found by professional astronomers, to learn more about the rocks' rotation and size (which is needed to figure out the asteroids' orbits). The telescope can also be used to search for and characterize asteroids that could pose a hazard to Earth. Of the 10,957 near-Earth asteroids found so far, about 13 percent (1,472 asteroids) are possibly hazardous. In all, Slooh plans to add 10 telescopes to the Institute of Astrophysics of the Canary Islands to participate in the asteroid campaign. "We're proud to be providing the essential resources that Slooh needs to expand their unique program to mobilize people around the world to monitor asteroids that may threaten our planet," Elliot Ginsberg, the president and CEO of the Connecticut Center for Advanced Technology, Inc., where Slooh is based, said in a statement. Slooh observactory representatives said that there is much work to be done in looking for asteroids, as many near-Earth rocks likely remain undiscovered. Astronomers estimate that 90 percent of 0.6 mile-across (1 kilometer) asteroids near Earth have been found, but only 30 percent of 459-foot (140 meters) asteroids and 1 percent of 98-foot (30-meter) rocks. Funds came from Connecticut's department of economic and community development. "This grant supports Slooh's model of collaborative consumption," stated Michael Paolucci, founder and CEO of Slooh. "By enabling people to share powerful telescopes situated at world-class observatories, we have built the easiest and most affordable way to train and engage citizen astronomers in performing real science. Absolutely anyone can learn to do this."